Every bride wants to offer their wedding guests a unique and unforgettable experience, especially when it comes to the food they will enjoy. Summer’s harvest of fresh ingredients creates an astounding array of choices when it comes to planning your wedding reception meal. 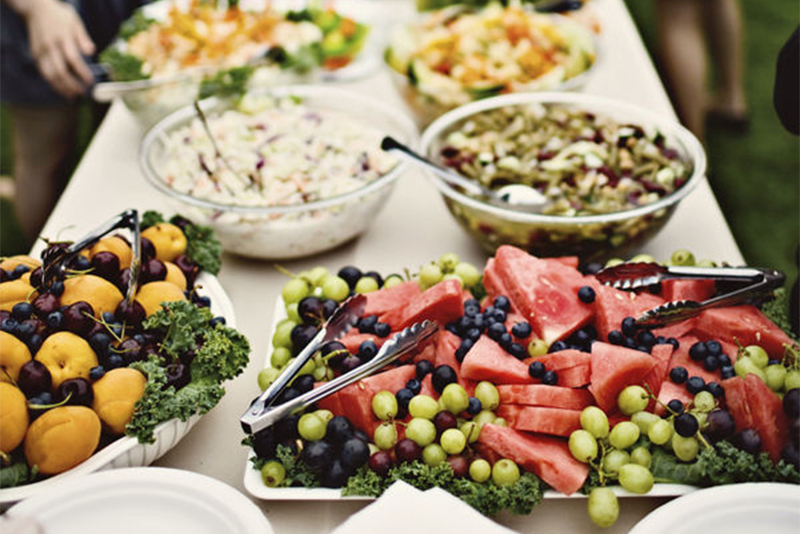 Consider these catering trends when choosing a menu that is both distinctive and tantalizing. A reception dinner doesn’t have to be heavy to delight your guests. Summer offers many options for dishes that will satisfy without leaving anyone feeling too stuffed to dance into the night. One current trend is lighter, fresher fare from local vendors who produce their offerings with natural methods and minimize use of pesticides and hormones. This reflects a growing nationwide consciousness of “clean eating” that’s not only healthier, but often far more flavorful than conventionally produced alternatives. The salad bar has found its way into many wedding events, allowing guests to combine simple yet sophisticated farm-to-fork ingredients such as pomegranates or Asian pear to salads made from a variety of heirloom lettuces and herbs. Meals infused with food truck flavor are another trendy option. An assortment of themed stations that recreate the street food experience allow caterers to present an enticing wedding meal with visual impact and entertainment value. This option allows guests to interact with chefs who elevate simple fare such as ramen noodles or tacos to gourmet heights. The street food approach is particularly popular for summer weddings as it reflects the season’s fun, free spirit. Parting with tradition doesn’t have to mean ruling out a sit-down meal. Many caterers are offering the option of serving dishes to pass, giving the meal a more communal feel and encouraging guest interaction. Shared dishes create a less formal ambiance without sacrificing elegance or taste. While wedding cake hasn’t necessarily given up its role as a centerpiece of the marriage celebration, many caterers are adding the option of offering guests an assortment of dessert selections from which to choose. Some couples are choosing to present attendees with additional cake alternatives, such as pudding, artisan cookies, fudge, or other handmade confections. A “cake” comprised of an assortment of individual cupcakes in a range of flavors allows guests to choose their favorite and then enhance it with a medley of toppings. Some are opting to eschew cake altogether in favor of dessert buffets or summer classics like make-your-own ice cream sundaes. When it comes to planning your summer nuptials, drawing outside the lines is often the best approach. Summer weddings offer a host of possibilities for making a striking impression while infusing the event with the season’s fun, laid-back spirit. Those are some great trends. I love that dessert bar. YES! A dessert bar is fun. My sister did that at her wedding and it was AWESOME. Thanks for the tips – I love the idea of a light menu and I love, love, love a good dessert bar!